It’s been a harsh winter and most of us are more than ready for spring and all the great things that get us outdoors. 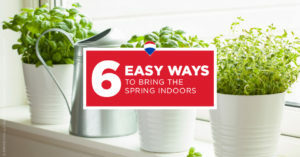 But wouldn’t it be nice to bring the spring season inside, too? Here’s a checklist of small jobs that will make an instant difference in how your home looks and feels this spring. Wash your windows. You’ll want a clear view of all the beautiful things happening outside. Dust lamps, light fixtures and light bulbs, and wash the winter dust off your blinds. Your home will feel fresher and brighter. Deep-clean your carpets, upholstery and curtains. Also swap out your bedding for lighter fabrics that are more suited the warmer temperatures. Store away your winter clothes and snow gear. You probably won’t need those skis, snow shovels or ice scrapers for a while. With these basics out of the way, you’re free to relax and enjoy the blossoms, warm breezes and all the wonderful things of spring. If you’re thinking about selling your home, these jobs are a good start to prepare it for the market.